Located in South Tampa along the shores of Tampa Bay is a gorgeous waterfront wedding venue, the Westshore Yacht Club. To showcase the beauty of this hidden gem and its outdoor spaces, we partnered with Tampa Bay wedding planner Kelly Kennedy of Kelly Kennedy Weddings and Events to create a classic, french country inspired styled wedding. 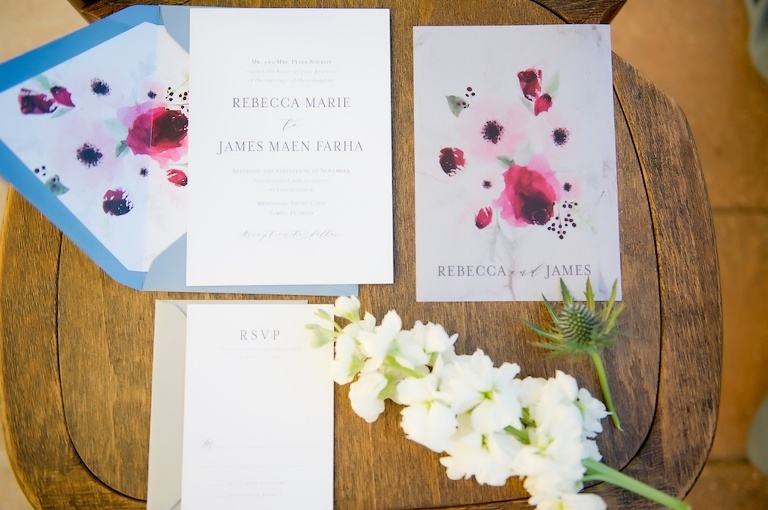 Stationery and letterpress print shop A&P Designs set the ambience for the wedding day, creating a watercolor floral invitation with matching envelope liner. For the outdoor waterfront ceremony, light blue fabric accents adorned the french country chairs while a garland floral runner led the bride and groom to a chiffon draped altar. The planner and venue staff then quickly flipped the ceremony to an elegant waterfront reception with amazing sunset view. The dusty blue table linens from Over the Top Rental Linens complemented the marina backdrop, while colored glasses and marble table numbers added elegance. Alessi Bakery provided an indulgent dessert table with an array of sweets that were beautifully displayed, complete with a two-tiered, hand-painted robins egg blue wedding cake. Guests could choose from berry parfait shooters, cake pops, and cupcakes. Every detail was magnificently captured by Tampa Bay wedding photographer Andi Diamond Photography. From the adorable bridal portraits with the family golden aided by wedding pet coordinators FairyTail Pet Care, to the stunning sunset that dazzled along the shorefront of Tampa Bay, this wedding truly showed that ambiance is everything on your wedding day. 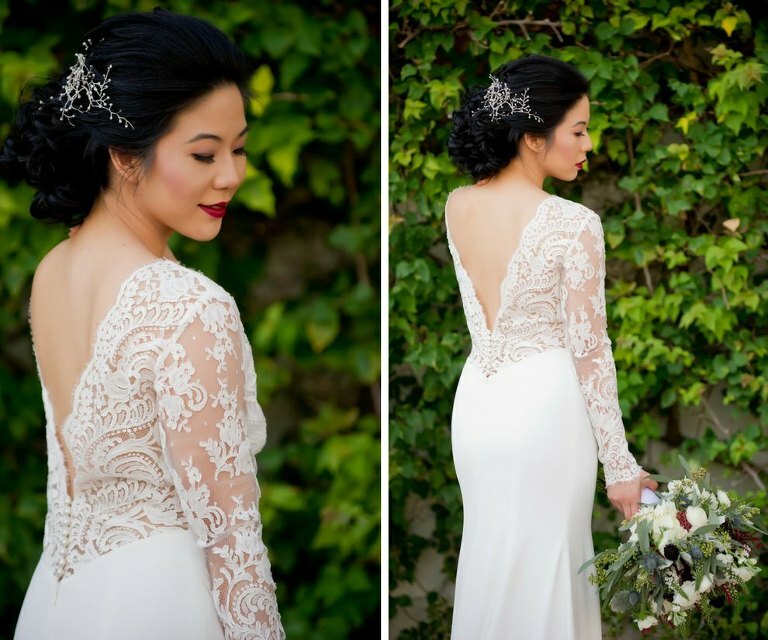 The bride’s effortless beauty was naturally brought out by Tampa Bay wedding hair and makeup team Michele Renee the Studio. 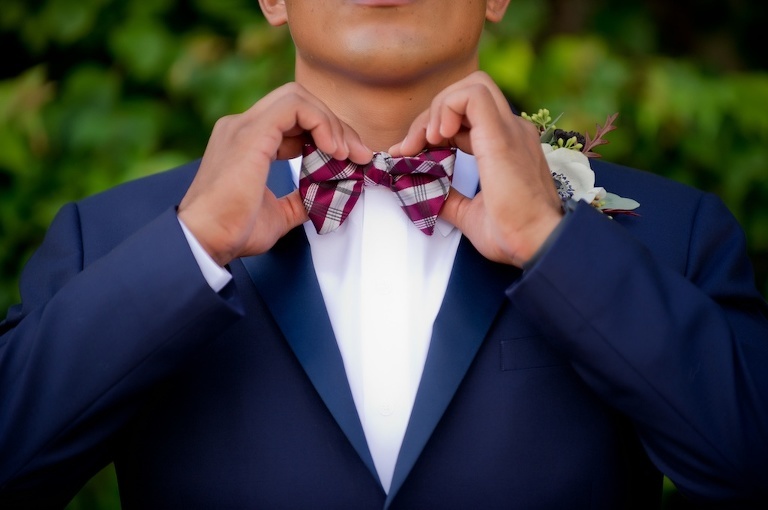 A sweeping up-do and a bold red lip created a glamorous look to perfectly complement the lace, long-sleeve Daalarna Couture gown from Tampa Bay bridal boutique The Bride Tampa, while the groom was dressed in a modern blue suit with plaid bowtie from men’s suit rental Sacino’s Formalwear. Classic and elegant French country. 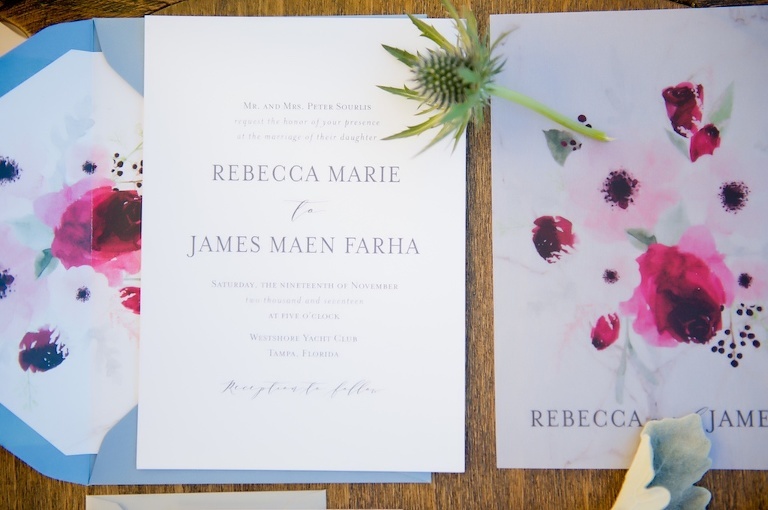 Our inspiration for this shoot was the venue itself. We chose colors in the blue family. We did that to accent the water that surrounds the Yacht Club. We also wanted a slight touch of color and added in burgundy. We chose that color as we thought it paired really nicely with the different shades of blue in the design of the tables.